Weather and age eventually take their toll on all of us. Alas, rose bushes are no different. 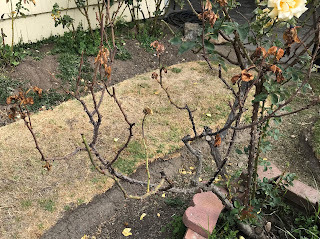 This fall, I've witnessed several of my otherwise healthy roses just cash out their winnings and stop sending water and nutrients to established yet older canes. The terrific heat we had in September and October, I'm convinced, just pushed them over the edge. If the rose needed to conserve water and it had been sending H2O to a cane that was, as the picture demonstrates, cane on cane on cane on cane on cane, it let the extremity die. Look closely at the picture and you'll see that two new canes are emerging from lower down. The rose is Oldtimer (see below) and as it's the last specimen of this unique rose in my garden, I want to protect it. As I'm not sure if it's still in commerce, I've been very reticent to prune it heavily. That in the long run maybe why the bush decided to prune itself or at least send me the signal that it had divorced itself from that large cane. With the ample rain we had last winter, spring and summer produced on the other side of this same bush two new basal breaks (canes emerging from the bud union or at least lower down). Flowers are certain to come from those new canes for several years in the future and Oldtimer, in spite of its name, abandoned its oldest cane. So as dramatic as it appears, nearly half the bush (really just one cane) gave up the ghost. I got my pruning saw out and the dead branch is now gone. Meanwhile, across the garden, an alba rose named "Madame LeGras de St. Germaine" also bid an adieu to one of its larger canes.